First-of-its-kind study at University of Iowa's National Advanced Driving Simulator shows how marijuana and marijuana with alcohol impact driving. roadway than drivers who use either substance independently. However, the cocktail of alcohol and marijuana does not double the effect of the impairment. The study, which was published June 23 in Drug and Alcohol Dependence, also found that participants who consumed only alcohol weaved more during a 35- to 45-minute simulated driving test than those who consumed only vaporized cannabis. 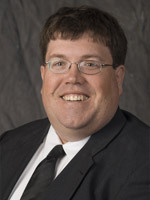 Gary Gaffney, associate professor of psychiatry in the UI Carver College of Medicine, is the study’s principal investigator. 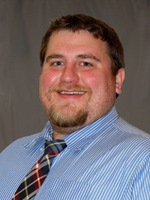 It’s co-principal investigators are Brown and Gary Milavetz, associate professor and head of the division of Applied Clinical Sciences in the College of Pharmacy. The results are part of a larger study—the first of its kind to analyze the effects of inhaled cannabis on driving performance—sponsored by the National Highway Traffic Safety Administration, National Institute of Drug Abuse, and the Office of National Drug Control Policy. The UI was selected for the research because of the NADS’ authenticity to real driving and the university’s expertise in medicine, pharmacy, and engineering. The NADS is the only simulator of its kind that is publicly owned. The outcomes could help shape future legislation in the United States where some experts say policies on drugged driving are woefully behind. To date, medical marijuana is legal in 23 states and the District of Columbia while marijuana has been approved for recreational use in four states and D.C. Since legalizing medical marijuana, Colorado has reported an increase in driving under the influence of cannabis cases and fatal motor vehicle crashes with cannabis-only positive drivers while states without legalized marijuana have experienced no significant change in cannabis-related crashes. In 2014, the National Highway Traffic Safety Administration’s Roadside Survey of Alcohol and Drug Use by Drivers found the number of drivers with alcohol in their system had declined by nearly one-third since 2007. However, that same survey found the number of weekend nighttime drivers with evidence of drugs in their system climbed from 16.3 percent in 2007 to 20 percent in 2014. The number of drivers with marijuana in their system grew by nearly 50 percent. Brown says plenty of research has been done on the effects of drinking alcohol and driving, but little has been done to measure the effects of using marijuana and driving. First, participants were given 10 minutes to drink a mixed drink with alcohol or plain juice in an alcohol-rimmed glass and topped with alcohol to mimic alcohol taste and odor. The idea was to get the participants blood alcohol level to about .065 percent at the start of the simulated drive. Next, they were given 10 minutes to inhale a placebo or vaporized cannabis using a vaporizing system designed in Germany called “Volcano Medic ™. 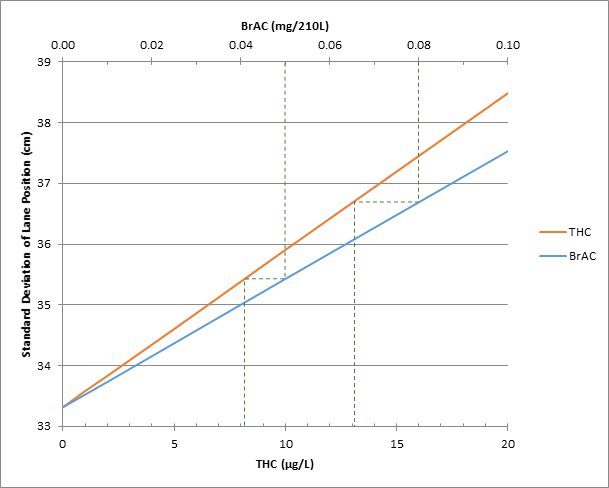 A comparison of lane weaving observed in a simulated driving study between common legal drunk driving limits (BrAC) and the blood concentration of THC that produce a similar amount of lane weaving. Once in the simulator—a 1996 Malibu sedan mounted in a 24-feet diameter dome—the drivers were assessed on weaving within the lane, how often the car left the lane, and the speed of the weaving. Drivers with only alcohol in their systems showed impairment in all three areas while those strictly under the influence of vaporized cannabis only demonstrated problems weaving within the lane. Drivers with blood concentrations of 13.1 ug/L THC, or delta-9-tetrahydrocannabinol, the active ingredient in marijuana, showed increased weaving that was similar to those with a .08 breath alcohol concentration, the legal limit in most states. The legal limit for THC in Washington and Colorado is 5 ug/L, the same amount other states have considered. The study also found that analyzing a driver’s oral fluids can detect recent use of marijuana but is not a reliable measure of impairment. Additional authors on the study include Rebecca L. Hartman (lead author), National Institute on Drug Abuse; Milavetz; Spurgin; Russell S. Pierce, VariableSolutions, USA; David A. Gorelick, National Institute on Drug Abuse; Gaffney; and Marilyn A. Huestis (corresponding author), National Institute on Drug Abuse.